Are you looking to connect with customers and boost your business sales, but aren’t sure where to start? 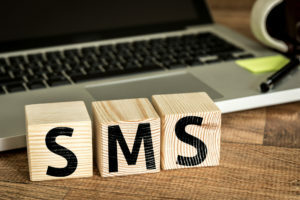 SMS advertising, or text message advertising is the perfect place to begin. Learn seven common mistakes to avoid with this helpful guide. 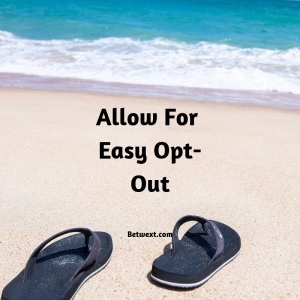 That gives you an easy record of people opting-in to your list. No one likes being interrupted by their phone with a useless message. I don’t… Do you? If you send a text message advertising a new event, sharing information, or highlighting a part of your business, always ask… will my customer WANT this message? Any text that you send should be short, clear, and have an obvious benefit for the recipient. 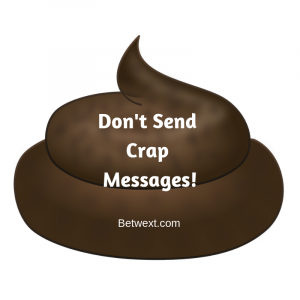 It’s easy to opt out of text message lists… you just need to text back the work “STOP”… so people will opt-out pretty quickly if you send messages full of garbage. Before you send any message you should ask if your customer on the other end really wants to see this message! Oh, and here’s a quick tip… make sure all of your text message advertising has a clear call-to-action! What other mistakes can you make? That’s the mantra of great marketers. They’re always testing new things… and you should too. Many marketers think because text messages are so short they can’t test… nothing is further from the truth. Even when you’re using text messages and sending SMS advertisements, you’ll always want to try something new. Change your call-to-action. Try a new opening line. Add a phone number instead of a link. Link to a video instead of an article. Through constant testing, you can determine what works best for your business. You’ll figure out what gets the best response and makes you the most money. 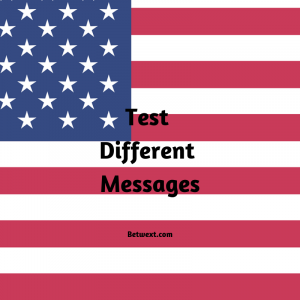 Constantly testing will really drive your sales higher… so don’t wait… test something new today! Regardless of how your text marketing is performing, you absolutely must have an easy way for subscribers to get off your list. 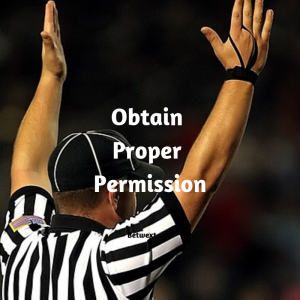 Not only is it good practice, and creates a level of confidence in your customers… it’s the law. The easiest thing to do, is remind people they can text back “Stop” to unsubscribe. Trust me, if people want off your list, you should just let them go. Focus on those customers who really want to hear from you. Annoying people isn’t a way to build trust and win sales! Oh, and here’s a tip. Some people just won’t text back the word “Stop” they might text back “take me off your list”… or “quit sending me these messages”. It’s important to review your responses every so often and take off people who don’t want to be there! How else can you mess up your text message advertising? 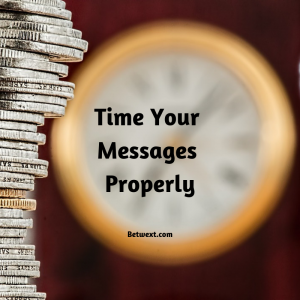 Sending your message at the wrong time is like pushing your ads right into the wastebasket… you might as well not send them. Every business is different… for some sending your SMS messages at about 5-7 pm local time works well. Most people are at home during those hours, relaxing after work, and they are more likely to engage with your message. For other businesses, sending a message in the morning or midday is the best time to get a response. For example, one of our clients at Betwext.com is a night club owner. He only sends messages at 10 pm or later! Sending a message that late for a Facebook sale, or a kids clothing store would be a waste! 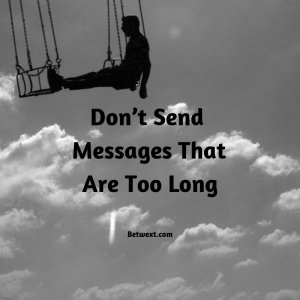 If you send messages too early in the day they’re likely to be ignored in favor of more important matters at hand. Too late at night, and you’re just going to make people mad. Figuring out when to text is just as critical as what to say! If you sell multiple products or services then you’ll want to segment your lists. Segmenting your list is really important. It allows you to send special information and offers, to those customers who are most interested in particular products or services. For example, I know one business that sells a product to Non-profits and a different product to Business owners. When people get added to their texting list, they always make sure to ask them if they are a business or non-profit. Depending on their answer, they add them to a particular list… and then send out information specific to their interests! Segmenting your list allows you to craft your message addressing the specific needs of each individual! At the very least don’t send messages for completely unrelated products and services. It’s just a waste of everyone’s time. If you do things right… your customers will feel like every message is tailored just for them! Text messages are meant to be short and sweet. Make sure you respect the character limit inherent to text messaging. (160 Characters for an SMS message and 300 characters for an MMS message). Remember that the key to text message advertising is to get your offers in front of people who are already interested… without irritating them. If someone receives multiple texts in a row, they’re likely to get upset. Now here’s a bonus tip… don’t text people too frequently. A good rule of thumb is once a week… but like everything it depends on your business. 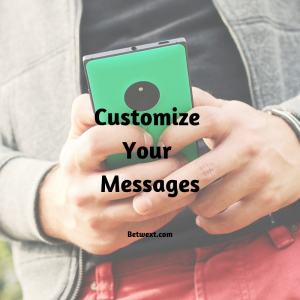 Are You Ready to Get Into Text Message Advertising? Today we covered 7 mistakes many businesses make when texting their customers. Take a second and think about your recent texting campaigns… have you broken any of these rules? As you craft your next message review this list… and make sure you’re doing your text message advertising right! You can download it free – right here.